I made Pokemon bento again today because my boy wanted me to make some characters that he chose last week. Beside Pokemon, he also chose some other characters from Sonic the Hedgehog. I then ended up choosing Shaymin, who has a small hedgehog-like appearance. The character I made was its evolution type, a raindeer-like appearance. If your kids are a Pokemon fans then I believe you are very familiar with the 'evolution' term here. Evolving Pokemon usually has new powers or skills which make them stronger. I did a quick cooking this morning for kids' bento. Inside the box : rice, sliced omelet on the top of the rice, chicken rolls with teriyaki sauce, and stir fry veggies (green beans, carrots, big chilli). Today is another hot day to bear. If you are in the same weather with me, please take care and drink a lot so we can survive the heat. Your creativity amazes me. I so can't do this type of bento. I love looking at your posts each day. Okay I don't know Shaymin but I bet MM does, and it's very cute too! Love it! Did you flip through the directory book? That's what I have to do, heh. It has to be simple for me to attempt it. I bet they loved this one! Mummy always do their best to fulfill their love one. Lucky him. @sheri fujihara chen : Hi Sheri! I bet MM does too. Yes, I have to borrow their Pokemon book to find out the character. Otherwise I have no clue except for Pikachu hahaha ... :D I planned to make before and after evolution character for Shaymin but not enough time to make both. Lia, you are such a sweet mom! hmm I dunno this character either, but you're so right! Sometimes the number of characters just keep on growing and I just lost track. LOL! His green details are so cool! I've never seen this Pokemon before... looks like I'm going to need to start playing again! You're really so good at carving eggsheet...! I bought a cutter from Daiso to make characters from eggsheet or cheese, but I haven't got the guts to do so, seems to be so complicated, maybe one day... For the time being I will just enjoy looking at your beautiful eggsheet creations :D)! My kiddo would LOVE this, she is a huge pokemon fan. Your egg sheets are cut out so perfectly, what do you do to get is so exact? Another wonderful bento you made! Oh my goodness, so cute!! The facial expression is fabulous, your so talented! love how cute this is. Is the lettuce under the stir-fried a bet to prop those goodies up? Adorable! 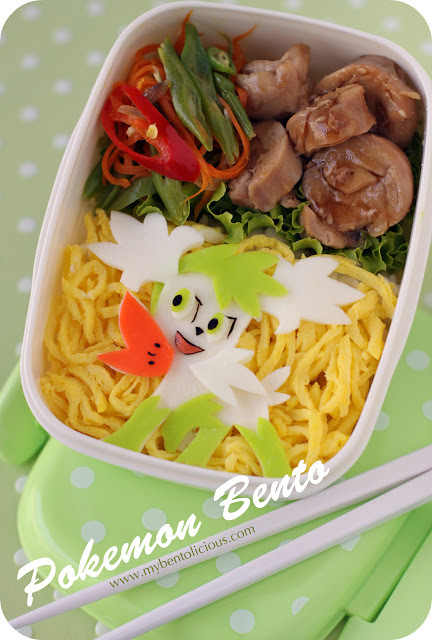 I love your pokemon bento's, they are always so detailed! @tatabonita : Then you are welcome to come to my kitchen anytime you are in Jakarta :) Thanks Tata! @Mommyof2girlz : Thanks a lot Steph for your sweet comment!